DALLAS, TX (Nov. 14, 2016) – As the holidays approach, Bennigan’s is inviting its guests to “Savor the Season” with a special limited-time menu featuring new chef-driven recipes and innovative drinks now appearing alongside the chain’s signature favorites. Hogan’s Egg Rolls – Delicious wraps filled with chicken, sweet corn, black beans and fresh herbs, perfect for dipping in housemade pineapple sweet pepper cream sauce. Classic Meatloaf Sandwich – Our Vidalia Onion meatloaf bursts with flavor, piled on a toasted roll and drizzled with zesty marinara and melted Provolone cheese. Enjoy with Homestyle French Fries and a pickle. Homestyle Meatloaf – Mouthwatering Vidalia Onion meatloaf, sliced thick and grilled to perfection. Served with maple glazed baby carrots, a mound of roasted garlic mashed potatoes and velvety Burgundy demi-glace. Diablo Shrimp Linguini – Scrumptious garlic shrimp with housemade Diablo sauce, tossed in linguini and sprinkled with Parmesan cheese. Served with garlic toast. Complete your winter feast with Bennigan’s Housemade Bread Pudding, drenched in hot Praline sauce and topped with a scoop of vanilla ice cream and powdered sugar. It will melt in your mouth! Cranberry Fizz – Stolichnaya Vodka, Peach Schnapps, Red Bull Cranberry and a lime and cherry twist, with a little extra Red Bull Cranberry on the side. Fireside Sangria – Jameson Irish Whiskey, orange juice, simple syrup with a Cupcake Black Forest Red Blend float and an orange twist. The White Irish – Kahlua, Malibu Coconut Rum, Jameson Irish Whiskey, Coco Real and Half & Half. Served in a martini glass with a cinnamon sugar rim. Irish Coffee – Jameson Irish Whiskey and fresh coffee topped with housemade lightly whipped cream and a sugar rim. Upgrade to Jameson Black Barrel for an extra kick. Only at Bennigan’s will you find this exceptional drink served tableside! Now with more than 150 restaurants open or under contract worldwide, Legendary Restaurant Brands LLC is continuing to experience strong growth while simultaneously redefining casual dining. Since the end of 2012, the company has opened new franchise locations in Clarksburg and Frederick, Md; Santa Clara and Fremont, Calif.; Melbourne, Fla., Saddle Brook, NJ; Tysons Corner, Va.; Veracruz, Mexico; Larnaca, Cyprus; Dubai, UAE; Panama City, Panama; and a new corporate location in Panama City, Fla.
Additional restaurants are planned for California, Florida, Kentucky, New Jersey, Tennessee, Texas, Pennsylvania and Virginia; and internationally in Mexico, Central America, Cyprus, Saudi Arabia, Qatar and South America. Legendary Restaurant Brands owns the iconic Bennigan’s and Steak and Ale brands – the pioneers of casual dining – as well as the non-traditional, fast-casual concept, Bennigan’s On The Fly. 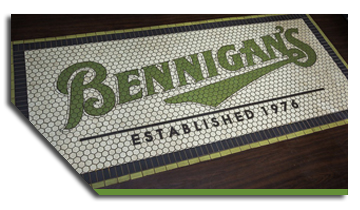 Bennigan’s is a high-energy neighborhood restaurant and tavern that is redefining casual dining. With chef-driven food, innovative drinks and warm, friendly Irish hospitality, this Legendary brand delivers memorable dining experiences to every guest and compelling returns to all its franchisees. Bennigan’s and Steak and Ale are celebrating their 40th and 50th anniversaries, respectively, in 2016.